This wee picture is of 500lb Luftwaffe Bombs which i found on a WW11 resource site. This is what you would seem to have a chunk of Peter. The 250lb would not give you such a big and heavy shrapnel remnant and the bombs over 500lb seem to be different shapes from your shrapnel piece. 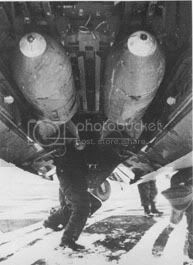 The SC500 was one of the standard Luftwaffe Bombs which was capable of taking out a large building or half a street. The nose was cast iron, which is the shrapnel remnant that you have and the main shell casing of the Bomb was a Steel extruded tube which generally disintegrated on explosion. I might be wrong, but i think that it was mainly 250lb Bombs, Incendiaries and Parachute Mines that the Luftwaffe dropped over the Clyde Valley and West Scotland, there were some 500lb Bombs dropped but i don't think too many in comparison. It wasn't just bombs that dropped during the war. A week long documentary into what Gran & Grandad didn't tell us what really went on during the blackout. EG: Pumping in the backstair lavvy or getting a right dose of clap and other STD's in the air raid shelter not to mention the huge increase in illegitimate children born while Dad was away doing his bit for King and country. Just like the Karen Dunbar Show dirty old woman character. I used to know an old lady in Paisley that used to tel all and sundry about her war time adventures, apparently she was a receptionist at the Central Station Hotel and had a a lot of adventures beyond her offical duties. An absolutely fabulous site with a great collection of photogrphs and comments! I have been through most of them and I think I can add a couple or so sites in Glasgow & district where bombs or mines had fallen. In 1940 four light bombs landed behind the Benburb football pitch in Govan, between the pitch and the railway (now the motorway ), on the west side of the Tinto football pitch which was used by the 'Bens' as a training pitch. No one was injured and nothing of military importance was hit, but the bombs were very close to the railway, and the ammunition factory just on the other side of the railway. Harlands' red-brick building, right beside the Govan vehicular ferry on the left side facing Partick, was hit by a light bomb and some damage was inflicted. Don't know what year this was. The Co-op complex at Shieldhall was either hit by a heavy bomb, or it was the location where a downed Gerry plane hit. There was a fierce fire. I have read comments of an eye-witness that it was a German plane, but I don't know, and tend to question whether it was or not. This was either the summer of '41 or '42.. There use to be a cafe at West Ferry, across from Dumbarton Rock. It got a direct hit during ( the Clydeside Blitz in March '41. To the best of my knowledge there were no injuries. On the right-hand side of the road at the Inchinan hill, near the bus garage, there were a number of glass hot-houses. They got a direct hit from a land mine...defintely a mine because I cut off a piece of the parachute. This was 1942 and I don't think anyone was injured. Doonunda, back on Sept 10th, you posted some first-class pictures of war scenes. I am particularly interested in the one which you say was HMS Howe. The Sunday in 1942 when this battleship left Fairfields', I was among a crowd of people standing along the Clyde on the vacant ground known in Govan as the "Sonny Desert", located between Fairfields' and Stephens' shipyards, watching HMS Beatty make her 'secret' departure from Govan. Now the way your picture is oriented, and where that crowd is situated, gives the impression the battleship is going upstream, when in fact she was going downstream. I think your picture is a reflection of the true scene: in the picture, Fairfields' is located further to the 'left' left-hand side, whereas it should be to the right of the ship. I am somewhere among that crowd in your picture. Regarding the name of the battleship, while building she was known in Govan as the "Beatty" ( after Admiral Sir David Beatty), and the name was changed afterwards to HMS Howe; don't know why 'Beatty' fell out of favour. Doonunda, thanks for posting that photograph; despite the 'reflection', it's a great picture, and the only one I have ever seen of the battleship leaving Fairfields'. Last edited by doonunda on Fri Feb 16, 2007 3:19 am, edited 1 time in total. Thanks again doonunda, for these additional great pictures, and the information about their availabilty. The first one, # 10381, is readily recognized, and was photographed from the opposite side of the Clyde to that used for the 'reflected' picture. Fairfields' cranes were very much a part of the Govan scene. This can be said about the "Howe" as well, she stood there beside Govan Rd for what seemed a long long time. It was quite funny about the day of her departure. Everything was supposed to be hush-hush, for fear of her getting caught in the Clyde by a bomber, and having no room to maneuver. Ach hush-hush or not, everybody in Govan knew she was leaving. This is part of a German bomb I found on the Kilpatrick hills any idea of size. ie 200lb? This Bomb fragment has now been donated to the local musum in the Clydebank Town Hall. peter wrote: This is part of a German bomb I found on the Kilpatrick hills any idea of size. ie 200lb? Do you reckon it was this size when intact? On the 8 March 1941, when the the fishing trawler STRATH BLARE was operating out off the east coast of Scotland, she was attacked by a Heinkel bomber. The crew were taken by surprise when she first appeared and circled round the trawler. They rushed to the guns but as she dived again to machine gun the crew, a wing hit the mizzen mast and she crashed into the sea. In doing so part of the Heinkel's wing was torn off and about 6 feet of the mast was torn away. As she hit the mast two bombs were dropped which landed on the deck. The bomb disposal squad removed the unexploded bombs from the trawler when she returned to port. Here a Bomb Disposal Officer is rendering one of the bombs safe. peter wrote: This Bomb fragment has now been donated to the local musum in the Clydebank Town Hall. I hope they put it on display and not keep it locked in a cupboard. Is the museum open daily? Yeah! that had me thinking did they fit all fishing boats with large calibre mounted guns hidden from view until required? By thier very nature fishing fleets were a valuable source of inteligence gathering so a means of self defence makes sense. Even during the cold war there was controversy about a trawler called "The Gaul" which sank mysteriously in 1974 in the Barents Sea which was reputed to be on a spying mission against the Soviets. Pgcc93 wrote: Did they fit all fishing boats with large calibre mounted guns hidden from view until required? I had to laugh on this one, thinking of the "Guns Of Navarone"
Sinking of the "Sussex" revisited. There have already been quite a number of very interesting postings on the sinking of the cruiser HMS Sussex at Yorkihill Quay in 1940; I thought however, that a personal experience regarding this bombing might be of some interest. It was I think in September 1940, and I had recently returned to Glasgow after having been evacuated to the beautiful island of Arran in the Firth of Clyde. The part of Glasgow where I lived was very much a part of Britain's industrial war machine, and it took me a while to become accustomed again to the night-time noises of a great city at war. I'd been asleep one night and was awakened by noises loud and strange, and not at all like the sounds of a foundry or a shipyard. The strangeness of the early morning awakening made me somewhat senseless for, I'm sure, a long period of time. I lay in bed listening to horrendous thundering from all around. I became aware that this thundering was the noise of an anti-aircraft barrage. From people who had not left the city I had heard of air raids and had seen the craters from bombs at a number of places in Glasgow, but an air raid was still only something I had read about or seen on the Gaument British newsreel at the cinema. Were not air raids supposed to be heralded by sirens screeching a warning wail guaranteed to awaken the deepest sleeper? Lying in bed there, I felt no fear, simply because my mind identified nothing from which fear stems. An awareness of what was going on came when I saw the figure of my mother silhouetted against the uncurtained bedroom window. She stood looking out the window, and having seen me resting in bed on my elbow, she informed me that it was just an air raid, and since these booming noises were guns, we had no cause for alarm (I was never too sure how she knew!). I was told to go back to sleep, since, according to my mother, it was almost over. My mother was right, the noises stopped. Weren't air raids supposed to end to the tune of a constant "All clear" wail of the siren at the baths round the corner? I heard no constant or any other kind of wail, but this could well have been the result of my going back to sleep in the bed from which I hadn't moved during the "raid". My father had just returned from working the night shift when I got up next morning and he told me to look out the window. I did, and saw a great pall of black smoke climbing into the sky from the area of the Clyde docks. According to my father, a boat had been hit by a bomb. This is what I was looking for: wow, at last I'd experienced an air raid, although I had slept through most of it and had yet to hear a siren wail in anger! There were no sirens so this meant school was not closed. My pal Angie(Angus) and I decided we would plunk school and go and see where all this smoke was coming from. We got a tram car to Govan Cross and walked down to the docks behind Harland & Wolff's shipyard, the location where the great pall of smoke seemed to be coming from. At the Govan ferry we saw the source of the smoke. Across the water in the Yorkhill quay a great ship lay over on its side with its superstructure stretched right over to the quay on the city side of the dock. At the ferry we found out it was HMS Sussex, a big heavy cruiser of the county class armed with 8" guns. She weighed about 9,000 tons and while this was far short of the biggest ships coming up the Clyde, she seemed immense lying there on her side at the quay. According to the chatter at the ferry she had got a bomb right down her funnel. This was our meat! We ran down the ferry steps to cross over for a better look... only to be chased back up the steps by the ferry man - no kids allowed over to Partick. Not to be done out of the very reason for which we had plunked school, we waited around until lunch time when all the workmen from the yards would be crossing on the ferry and it would be crowded. This we did and joined the crowd of dungaree-clad shipbuilders in boarding the ferry. We managed to cross over without any difficulty, but as it turned out we could have seen more from the other side as there was a 6 feet high fence all round the dock. To us this fence presented no great problem. Big Angie gave wee Dugald a pucky up onto the top of the fence and Dugald helped Angie up. We both "dreeped" over the other side and hid behind a shed, right beside the massive hulk of the Sussex. Many people - firemen, sailors, marines, policemen - were working frantically on the still-smoking bombed cruiser. Important-looking people in all sorts of uniforms ran to and fro in front of us, far too busy with the task at hand to be bothered with two Glasgow urchins in short trousers gaping in awe from behind a shed. There was a row of clear wooden boxes alongside the shed we were hiding behind. I don't know what they contained. I know what they looked like, but we never did ascertain if they were body boxes. In the height of the excitement we didn't dwell on them too much. A steel helmet, thickly covered in black oily muck lay at the foot of a gigantic heap of oily sludge that was being removed from the ship. While Angie kept watch I crept over to the heap, grabbed the helmet and scurried back to watch while Angie did the same. The steel helmet bore the name of a captain (rank, not the captain of the cruiser) and other hieroglyphics that left no doubt that it had been a part of this tragedy. This steel helmet became mine, to be treasured and used through all the air raids Glasgow ever had afterwards. Having made a couple more dashes over to the heap to each get an officer's cap we then made our way out by the way we had come in. There was no trouble getting over to Govan with the ferry and on to the tram car and home to hide our loot, now safely hidden in a cardboard box. We spent that night in Angie's back-court washhouse boiling everything to try and get rid of the black oil. We never did of course, the padding in my helmet always stank of oil - a constant reminder of where it had come from. The officers' hats fell completely apart with all our boiling but we were able to save the gold-leaf-thread badges (I wore mine on a Clyde Navigation Trust cap and it looked just like a navy officer's hat). I had known about this cruiser being in Glasgow. She had been in a dry dock some place and could be seen from across the water, for quite some time, then she disappeared until the day I saw her lying on her side at Yorkhill. I suppose in retrospect, that she could have been serving as an anti-aircraft ship, and perhaps it was her guns which wakened me in the night. In all my reading of books about the war, I only ever once read anything her being bombed on the Clyde and this was only a cursory mention of it. How many men were killed on her I don't know, but there must have been quite a few, although she would not have carried a full crew while docked. If she was repaired and went to sea again, I couldn't say. I never saw her again. Yes, we had been guilty of looting. This was a very serious crime during the war and, so we had been told, one could be shot for it. Many looters were shot in Germany, but I don't know of anyone ever being shot for it in Britain, although I'm sure there were cases of real "looting". Our "looting" was really souvenir hunting, and it was never anything I felt any shame over... just schoolboy stuff. ( Since writing this, a great deal more information about this sinking has been written and is currently available in earlier postings on this excellent and very informative thread). Thank you so much for sharing that memory Dugald, it's anecdotes like this that bring all the history, as it is to me, to life. Do you still have the badge? Pgcc93 wrote: [Yeah! that had me thinking did they fit all fishing boats with large calibre mounted guns hidden from view until required?